Her green eyes regarded me with affection, her long dark brown hair cascaded over me as she leaned in for yet another loving kiss...."Hey Andy!" Someone is rudely shaking my shoulder. "Come on now Andy, wakey-wakey you're on watch in ten. Move yer arse outta da sack, the mornin' watch awaits your presence." I recognize the gravel voice of Leading Seaman (LS) Ross Farrell, one of the torpedo fore-endsman. "Good news is, there's a fresh pot of java on the go." I curse to myself as the call to go on watch always seems to happen just when my dreams begin to get interesting. 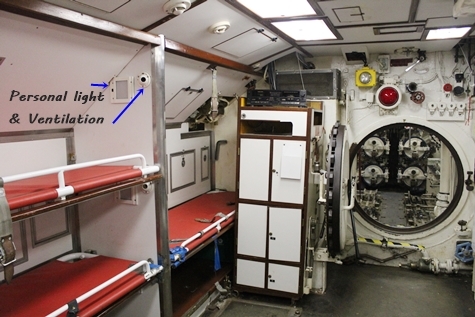 I glance around and observe that many of the 21 berths in the forward accommodation space are occupied with off duty submariners. I also note that the ventilation is shut down adding a silent stillness in the red-lighted environment along with the usual amalgam of odours - diesel oil, strong coffee and gym bag perfume. This can only mean that since I crashed into my bunk at midnight, we've gone ultra-silent. I swing my legs over and get quietly dressed in my 'poopy suit', a one piece garment of lightweight cotton, grab a cup and fill it with coffee and head aft to relieve the senior watchman in the sound room. LS Knocker White, the senior sonarman of red watch, reports the status of the boat and the contacts currently being tracked. "We're at 400 ft, in the ultra-silent state. The sea state is 3 so, not much wave action. There's some biologicals (assorted marine life) about somewhere to the east of us and we've got a merchantman on a bearing of 335 with a rev count of 110, single screw. Got a really noisy diesel, likely some old rust bucket that shoulda been put down years ago. He's drawing left on a course of 215, designated tango - 63. No other contacts pretty quiet watch"
I give Knocker a nod of thanks and take over his chair and headphones. I sip my coffee and slew the '187' transducer over the merchant bearing and have a listen to her propeller noise. Yep, 110 revs, definitely single screw, signify a steady speed of about 12 knots. Able Seamen Jim Simpson & Danny Edwards join me in the sound room and assume their watch duties. Danny is the latest addition to our team and new to submarines. He is progressing well on his qualifications and keen to be the best sonarman on board. The bugger has great ears and very eager to learn. I've no doubt that he'll be one of the best very soon. I repeat the report left by Knocker who, by now, is likely to be in his own 'rack' and check in with the control room. We settle in for a four hour watch of listening intently on 3 different types of passive sonar. As the senior, my role is to ensure things are working as they should, report all new contacts, classify these and report to the control room all the relevant details, the course, speed, and type of vessel. The chief on watch in control will plot all these details on a chart in order to have a visual reference for the CO. Our principal role however is to detect the presence of other submarines especially Soviet boats. The reason for being in the ultra-silent state is in order for us to fully utilize the 'type 2007' long range sonar system used to detect the presence of Soviet submarines and surface warships without ourselves being detected. And so we continue to diligently listen to the sounds in the ocean and make frequent reports to the control room. Image of the forward accommodation space after de-commissioning when Ojibwa was not in use however, it does show the long narrow table in the centre of the space. LS Butch Bagnall, AB Dave Smith and Kenny Hamilton, the white watch sonarman, materialize to relieve us and I turn over the headphones, make my report to Butch and head to the galley, a room not much bigger than Mom's walk in closet for some breakfast. Bacon n' eggs and brown toast are the usual fare and I head back to the mess to enjoy them before I have to turn to my other duties. As I eat, I again marvel at what 2 cooks can create in such a small space. The food and meals on board Canadian subs are second to none. I finish breakfast, rinse the dishes in a plastic tub at the end of the table and stow them in a rack provided. I meet with the chief and we discuss the agenda for today. Since we're at ultra-silence only vital maintenance work can be permitted and then only if it is quiet and won't disrupt the sonar systems. For most of the crew, the order is for off watch personnel to either do paperwork or stay in their bunks until called for watch duties. I won't go back on watch until 16:00 so tackle some overdo maintenance reports and do some chart corrections also overdue. I've had my rum tot and some soup & a sandwich so time to put my head down for a couple of hours, I crawl into my 'rack' and fall almost instantly asleep. Clang! - Clang! - Clang! I jump up and am on my feet heading towards my action station in the sound room. Knocker is there and he reports that they've detected and classified a soviet 'Alfa class' boat, now designated 'tango - 71', at some distance to the north-east. Its bearing is steady and slowly closing us. He did manage to catch very faint blade flutter on the 2007 and felt that the Alfa was at periscope depth at the time making 10 knots. All that can be heard now is faint machinery noise on the bearing suggesting they've gone deep. Knocker has recorded the Alfa and he & I go through a classification routine to confirm that what was heard was indeed a Soviet Alfa. I agree. A Soviet Alfa Class submarine was approximately ten metres shorter and a little more than a metre wider than Ojibwa and carried only 31 men. The blade flutter and cavitation sounds were a strong indicator of a sub. The faint turbine whine on the bearing also indicates a nukkie boat. It's always good to get a second opinion. 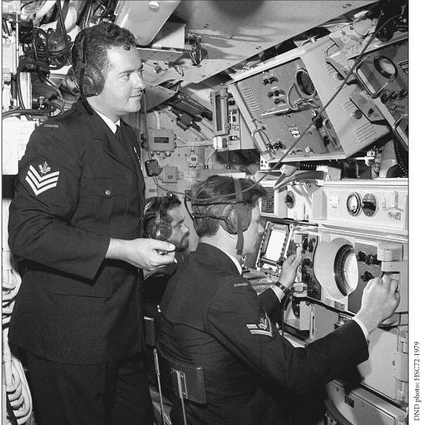 We check in with the control room plot and are ordered to do an 'all-round scan' prior to coming to periscope depth. We need to ensure there's no traffic nearby that could be a hazard to us as we come up from the deep. We rise to periscope depth and a message reporting the Alfa is fired off coincident with the required sit-rep on a secure network. We head back down and resume the Ultra-quiet state once more. Knocker & I listen on the last reported bearing and again establish contact with tango - 71. The Captain drops into the sound room and asks "have we still got her lads?" "Aye sir, on a bearing of 055 making only faint machinery noises, that he's not cavitating, suggests he's gone deep." We hand him a headset and he listens for himself. He nods his approval and returns to control and orders a course to close the distance. He also orders a depth change to go below the current thermal layer in order to reduce the possibility of being detected. This is part of a strategy of cat n' mouse that we'll play. There are thermal layers in the oceans that create natural corridors that sound moves through like a valley between mountains where you can hear echos. Moving into a different layer is like moving to the other side of the mountain. The Ojibwa is one of the most silent submarines in the oceans and detecting her while submerged running on her batteries is difficult in the extreme. It gives her a significant advantage as she can sneak in closely and position herself within striking range without ever being detected should the order to attack ever be received from our political masters. The trick is to move up through the layer, listen for a bit, get the latest data on the target while remaining silent then slip back down again reducing the risk of being detected. The word gets around the boat that we've got an 'Alfa' in our sights and throughout the boat there's a sensation of heightened professionalism and focus from everyone on board. We all know that while we are not at war, tensions between the so-called super powers are such that an all-out nuclear war could begin with only the smallest of provocation. Should the unthinkable begin then we are all very aware that we are the part of first line of defense against Soviet missile subs known as 'boomers' and their hunter-killer cousins. So, we do our jobs in the sound & control rooms with the knowledge that every man aboard is highly trained and will do theirs. All are prepared to act instantly and instinctively to any orders given. We've been closed up at action stations now for nearly 3 hours still in Ultra-silence and the lack of ventilation is becoming noticeable. The heat from the sonar equipment has the three of us sweating uncomfortably. Chief Eric Saunders on the plot sends a messenger to get some cold water for us and others in the control room. The captain, XO, and weapons officer are busy getting a firing solution and we do our part feeding the most up to date data on the Alfa. The captain sees this as a great opportunity for us all to hone our skills and work together as a team. She is now abeam of us and we are tracking her with the 'type 187' sonar. She shows no sign that she is aware of our presence and we are able to get a good recording of her sound signature as she draws down our starboard side. It's curious to note that as the two boats closed the distance the reports coming in and out of the control room became more and more whispered as if normal speaking voice would give us away. I suppose it's reassuring to know that we are all human. The plot has determined the course and speed of the Alfa and plotted the course to the south of our patrol area. We stand down from action stations and again go to periscope depth and turn away from the Alfa knowing that another NATO boat will pick her up in their patrol area. Once far enough away, we snorkel to recharge the battery. The intake of fresh air is very welcome as the ventilation is engaged throughout the boat. Knocker White is relieved by Danny who's action station is control room messenger. We are scheduled for the 'first dog' watch anyway so we'll stay closed up until 18:00. There are 7 watch periods in any 24 hour period. Each watch is 4 hours except the 'dog' watches these are 2 hours each from 16:00 - 18:00 and 18:00 - 20:00. On a 3 watch rotation it allows that everyone gets to stand each watch once every 3 days. So, Jim, Danny & I will next be on watch at Midnight. But now it's time to eat some supper and then go over some of Danny's practical factors towards him getting his dolphins. Every submariner must qualify for submarine duty and qualifications are rigorous and demanding. Every man aboard must know in detail how every system, back-up system, electrical, hydraulic, pneumatic weapons, engineering and propulsion works. They must know where every valve, every switch, every cross-connection of systems is located and he must be able to find and open or shut them all in total darkness. His life and that of his shipmates may one day depend on this knowledge. When the XO is satisfied that the trainee has achieved this level of competency he is awarded his dolphins and he becomes a member of a very small but elite class of Canadian sailor. Danny and I have discussed his progress and now....it's time to learn the intricacies of the sewage tank and what to do with its contents. Boy I've been avoiding this one but thankfully we're still snorkeling. I check with the officer of the watch for permission to blow the sewage and get the ok. I ask Danny to explain how it all works from the moment we rise from the head to the time we share it all with the surrounding ocean. He seems to have a good grasp of the process and we proceed to successfully accomplish the task. However, just as we're about to vent the tank I feel in my ears that the boat has slipped a bit deep and the snort mast intake valve has shut and the engines are rapidly stopped. Talk about bad timing. We vent the tank to equalize the pressure and the smell gags us. We're gonna be very popular as the boat's ventilation system quickly spreads the bad news everywhere. Thankfully the order to restart the diesels will make the experience short lived. Danny shrugs and grins, I shake my head and sigh. 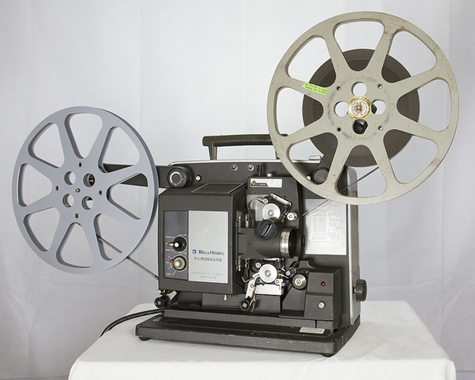 The XO has completed his rounds and Danny & I join some off watch bodies for a 16 mm movie in the fore-ends. It is Bullitt, one of my favorites with Steve McQueen. This'll be the 3rd time playing it already on this trip and it will likely be played a half dozen times more. The option is The Sound of Music thankfully still in the can it came in. But, as I'm going on watch soon I decide to opt for some sleep instead. I head aft to wash, shave and brush my teeth. Then it's back to the mess, peel out of my poopie suit, climb into my sleeping bag, draw the curtain and close my eyes. Her green eyes regarded me with affection, her long dark brown hair cascaded over me as she leaned in for yet another loving kiss...."Hey come on now Andy wakey-wakey your on watch in ten." Someone rudely shakes my shoulder "Move yer arse outta da sack, the night watch awaits! Good news, there's a fresh pot of java on the go"
David Anderson served in the RCN from Aug 1965 to April 1973. After basic training at Cornwallis, N.S. and Sonar training in HMCS STADACONA, David was posted to HMCS OTTAWA, a DDH type destroyer. During a Springboard exercise in the Caribbean in Jan 1967, David was given an opportunity to spend a day on board HMCS ONONDAGA. He was hooked and immediately applied for submarine service. After submarine school in Halifax he was posted to HMCS ONONDAGA to begin his qualification and received his dolphins in January 1968. In the spring of 1968 he was posted to HMCS OKANAGAN under construction in Chatham England. On June 22, 1968, the Okanagan was commissioned and David was a member of her first crew. After all the trials, tests and workups Okanagan sailed home to Halifax. 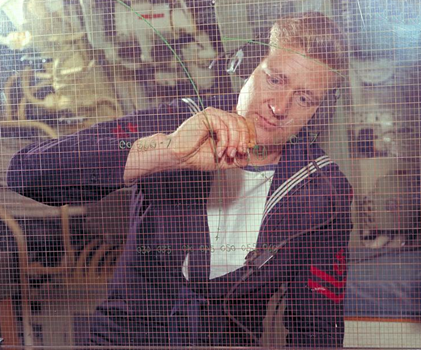 Soon after, David was posted to HMCS OJIBWA where he remained a sonarman until he left the navy in April 1973. David continued service with both Federal and Provincial government departments until he established an agricultural business in 1989. He sold his farm business in 2004 and returned to government service until he retired in August 2011. He now spends his time pursuing his photography and playing golf.